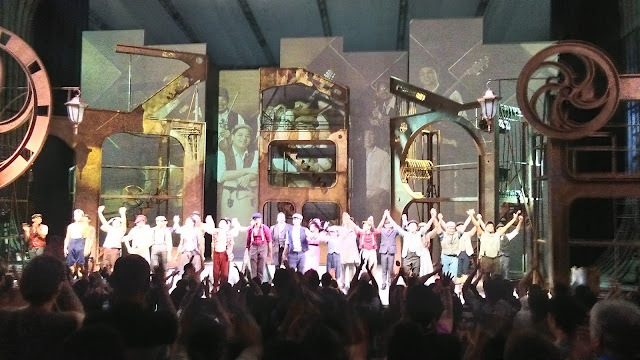 Anybody slap my face if I say that 9 Works Theatrical and Globe Live's Newsies is fine. It is not. It is awesome! The latest production that is ongoing throughout all weekends of July is a spectacular show that makes Filipino talent comparable to touring big Broadway productions -- or even better. I say the latter. 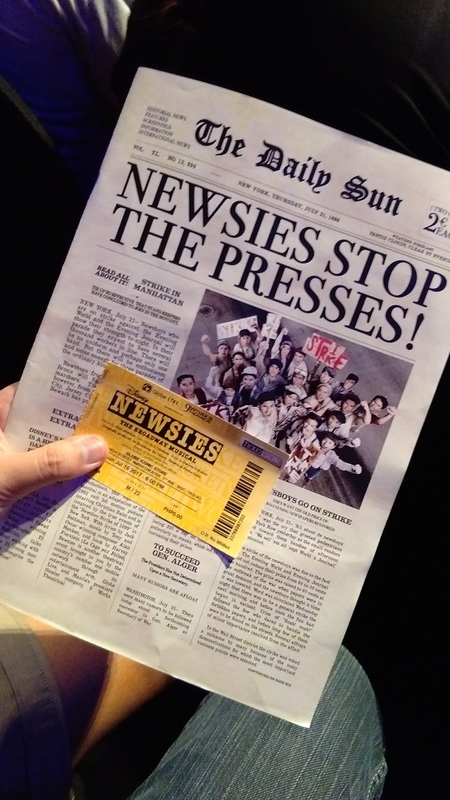 Staged at the Globe Amphitheater in Bonifacio High Street, the set brings you to 1899 when all the things happened for our poor newsies (newspaper boys). See every event unfold when the rusty towers move and the backdrop projection are like pages of a newspaper. Then the newsies bring the stage to life with pure energy and powerful voices letting us hear their story and voicing out their rights and concerns as an employee. A very relatable issue that is also tackled up to this day. Their pirouettes and splits and jumps are to watch out for. The Newsies Training Ground really paid off with the skills showing the diversity and exceptional energy that is shared by the actors to the audience. 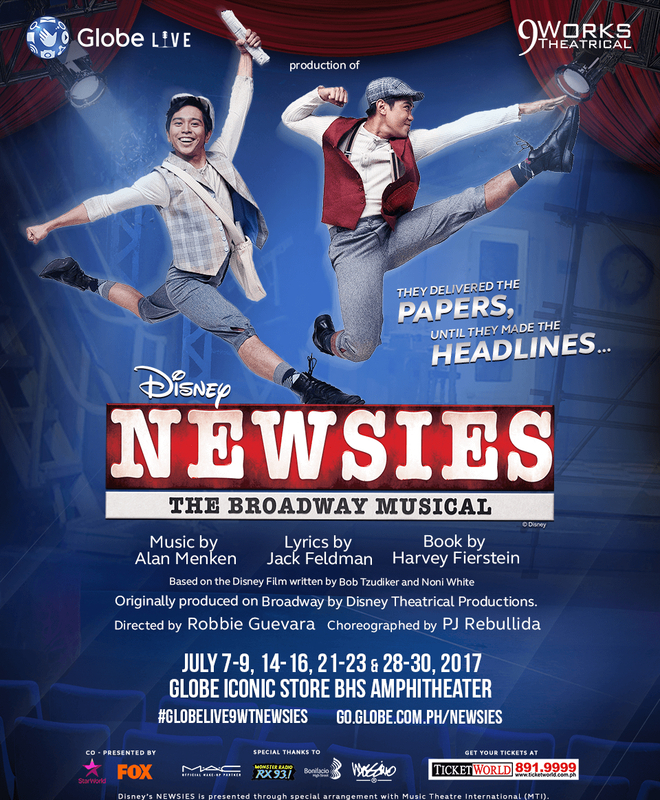 Give Gian Magdangal a warm comeback as Jack Kelly in Newsies. It seems just like yesterday when he played Danny Zuko in Grease and his leadership to a young group has turned out to something more relevant. Mickey Mouse has definitely gave a good amount of magic dust on him. Same goes to the Kings of New York, they have earned an audience acceptance as triple-threats in the theater industry and will make you ask for even more. Kudos to the whole production team, to director Robbie Guevara, and actors that will make us thankful as our eyes opened for our rights and equality as we enjoy a spectacular show. And don't forget to get a souvenir program for this show! Catch Newsies all Fridays to Sundays of July, until July 30, 8PM. Presented by Globe Live and 9 Works Theatrical.